The Librarians is based on the film series The Librarian, starring Noah Wyle as Flynn Carsen. Carsen is one of the longest surviving Librarians aiming to protect The Library, a mysterious location storing magical artifacts that must be kept hidden from those who want to misuse them. Colonel Eve Baird (Rebecca Romijn), a former NATO counter-terrorism agent chosen directly by the Library to become the Guardian, a protector and a spiritual guide for the Librarians. Cassandra Cillian (Lindy Booth), a mathematician with synesthesia and photographic memory. She thought a brain tumor was responsible for her abilities, but after the removal of the tumor, her gift remained intact. Additionally, she acquired the capacity of telepathically placing thoughts in other people’s minds. Ezekiel Jones (John Harlan Kim), a professional thief used to working solo. He managed to hack a vast number of law enforcement agencies, and he’s a technology expert. Jacob Stone (Christian Kane), a former oil worker with in-depth knowledge of art history and architecture, as well as an IQ of 190. He has hidden these abilities from his family. Jenkins (John Larroquette), the immortal caretaker of the Annex. He is 1,000 years old, with an immense knowledge of all things regarding the Library. The Annex becomes a base for The Librarians, and Jenkins serves as a counselor and a guide. Over the years, this group of people has become like a family. Together, they have learned to appreciate their gifts and to use them for a good cause. The show often underscores how knowledge and research can be stronger than the mere use of physical force to overcome an enemy. Cassandra, Ezekiel, Jacob, and their Guardian (Eve) – often accompanied often by Flynn and with the precious help of Jenkins – have the task of protecting the Library and its artifacts, discovering new artifacts, and fighting the enemies who try to access the Library. During The Librarians season 1, the enemy was the Serpent Brotherhood, led by the mysterious Dulaque (Matt Frewer). During The Librarians season 2, the Librarians had to face two fictional enemies. These were Prospero (Richard Cox) from Shakespeare’s The Tempest and Moriarty (David S. Lee), Sherlock Holmes’ chief nemesis. During The Librarians season 3, the Library had to be protected from Apep, the Egyptian god of chaos (Amin El Gamal). In The Librarians season 4, premiering Dec. 13 on TNT, the characters will have to face a new kind of potential enemy: the Library itself. Confronted with a dark mystery about the Library, every Librarian must ask themselves some tough questions: Is the Library itself good or evil? After millennia of one Librarian at a time, is it dangerous to have multiple Librarians working together? Can a Librarian ever live a normal life filled with love, friends, and family? 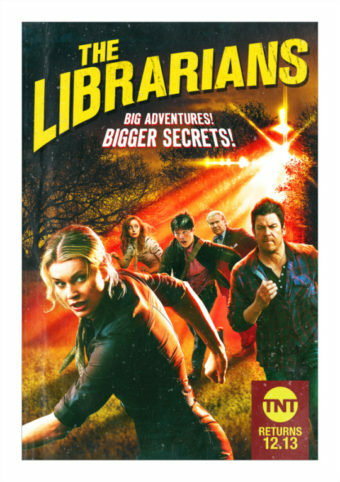 The Librarians have a lot of research to do, but this time, they’ll need to find the answers inside themselves without any books or prophecies. Be sure to check back next week for our recap of the season 4 premiere: The Librarians 4×01, “And the Dark Secret.” In the meantime, you can catch up on the show via Hulu or Amazon, or view some episodes from The Librarians season 3 on the TNT website.